In the run-up to the release of the new Steemeum Android app v2.0, the Steemeum website and the daily miner and statistics posts are updated. The website didn't have much dynamical data presented to inform specifically the new to Steem users, and for this reason the following elements have been added to the website. To let visitors of the website know when the virtual mobile miner rewards are send out, a countdown clock is added that countdown every week: the days, hours, minutes, and seconds remaining until the next SBD transfers each Sunday 12:00 UTC. Rewards countdown timer, and displaying underneath it the total SBD rewards in the pool. Under the new countdown timer is now also displayed, the total rewards in the pool for that moment. During the week this number grows, and it will be back on 0 after the payout on Sunday. 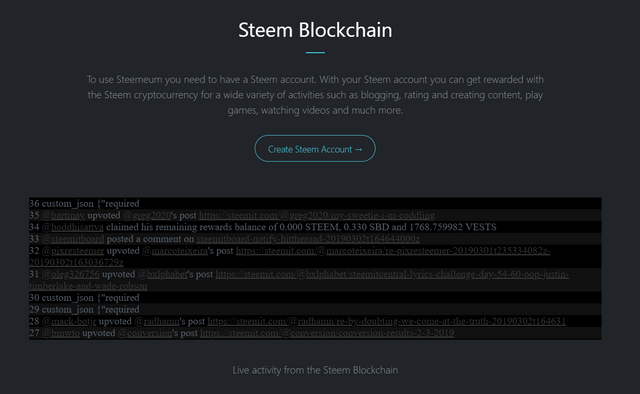 New to Steem users that visit the Steemeum website maybe have no idea of what Steem have to offer, and for this reason beneath the brief Steem blockchain explanation, is added a live Steem blockchain activity viewer. If you want to have similar functionality on your website, have a look at the Steem tutorials from @gokulnk and @sogata. The daily miner and statistics post is updated to also represent the upcoming app update and be more informing and inviting. Statistics are put into tables. Future improvements for the statistics are to add line charts based on historical data. Planned updates for the website are to display the rankings of the Steemeum users for that week, and show the average weekly payouts. 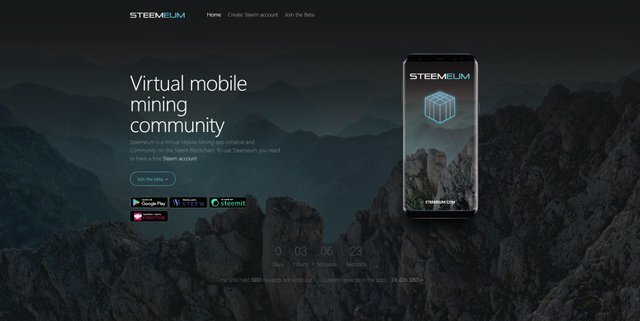 Read more about Steemeum in the introduction posts, Join the Steemeum beta on Discord. Steemeum is and can be funded with Fundition. @gingerninja, thanks for your comment, and happy to hear your feedback. Good job @steemeum! Suggestion: Perhaps adding referral? Thank you @robmojo, a referral system is on the wish list, thanks for requesting / suggesting. What exactly does it mine?... And how? Hi @igormuba, users mine time, and compete with each other and are rewarded based on the gathered time by the user each week. Hope to join to testers of @steemeum app! Aweeome. I didnt get my yestardays pay out. Could anything be wrong?